La Jolla is another example of the extraordinary selection of first class municipal courses. Torrey Pines is a credit to the City of San Diego, which manages the two golf courses in impeccable fashion. The result is a PGA Tour venue, as well as a U.S. Open host, and also one of California's finest golfing destinations. 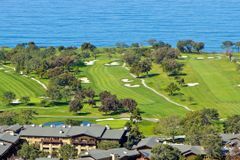 The host of the PGA Tour's Farmers Insurance Open has been at Torrey Pines since 1968, where both the North and South courses are put on display for the best golfers in the world. And after hosting the 2008 U.S. Open, where Tiger Woods went onto win, the San Diego golf course will be set to host the prestigious event for the second time in 2021. The South Course is the star of the show at Torrey Pines, welcoming the finest players for the final rounds of the annual Farmers Insurance Open on the PGA Tour, and also the 2008 United States Open host. The South Course's layout was originally formulated in 1957, but recent revisions were completed by Rees Jones. While the golf course and its rare pine trees are incredible, the lasting impression of the South may be the remarkable views of the Pacific coastline. There is no better example of this than the short 3rd, whose green is perched on the cliff top, providing awesome vistas back down towards La Jolla and San Diego beyond. It is incredible to believe that Torrey Pines is a public facility, as it is a truly magical golfing experience. Not to be outdone, Torrey Pines' North Course is also excellent. While it may not be as challenging as the renowned South Course, many locals enjoy the stunning beauty of the North Course. Picture perfect views round off the experience at this Californian classic.